Joan Laporta was President of Barcelona Football Club from 2003 to 2010. In 2003 a new generation of young and dynamic directors came to Barcelona and generated a real shake-up. They popularised the expression virtuous circle, which aimed to strengthen the Club economically and socially and prepare the ground for a winning team that would nurture its social dimension. A number of innovative measures were set up, such as holding Board meetings in different parts of Catalonia while reinforcing communication with the fans through the revitalisation of the Barca magazine and a determined drive to promote the Club’s TV station, which took the name of Barca TV. During Joan’s mandate, the values which had traditionally characterised Barcalona were strengthened: Catalan identity, public-spiritedness, solidarity and universality. In the first season the team improved match by match and finished as runners up in the league. The following season, 2004-2005, featured the signings of Eto’o and Deco, key elements in winning the league title for the first time in six years. The expectations raised by that team were confirmed the following season when, as well as renewing their league title, they also won the Champions League in Paris against Arsenal, the second European Cup in the Club’s history. Despite such a successful record, which made the President extremely popular, the law courts ruled that the first ten days of his mandate, from 20th to 30th June 2003, were equivalent to a whole season, which forced the Board to call elections in September 2006. Joan stood again and was re-elected. The 2006-2007 season started with the signing of the agreement with UNICEF, in which the Club committed itself to collaborate economically and in addition wear the UNICEF logo on the shirts of the football team. This was an unprecedented move designed to strengthen the strategy of converting Barcelona into “more than a club” throughout the world. In 2008, Josep Guardiola was appointed first team manager. The year before he had taken over the reserve side, Barcelona B, when they were on the verge of promotion to Second Division B. After this appointment the most brilliant season in the history of the club began. The football first team achieved success in every competition in which they took part. The team won the Kings Cup, then the league and finally the Champions League against Manchester United in Rome, the third European Cup in the Club’s history. At the beginning of the next season, this list of titles was extended to include the Spanish Super Cup, the European Super Cup and the World Club Cup, making this Barca the team of the Six Cups. The World Club Cup won in Abu Dhabi against Estudiantes de la Plata (2-1) was the only competition never won before by the Club. 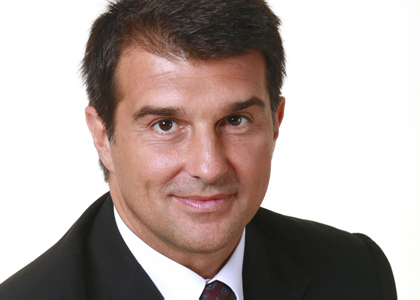 President Laporta was then able to round off his mandate with another league title in the 2009-10 season. In Joan’s seven years as President, Barcelona won the World Club Cup, two European Cups, the European Super Cup, four League Titles, the Kings Cup, three Spanish Super Cups and three Copes Catalunya. In the economic and social areas the annual budget increased from E170 million to E445 million whilst membership rose from 106,135 to 173,701.